For the past 23 years, Baljinder Basi has taught East Indian dance to children in Prince Rupert. 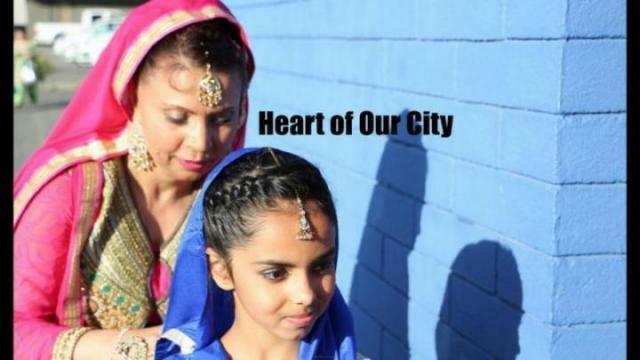 Baljinder Basi has been teaching East Indian dance to girls in the community for the past 23 years. The girls recently performed a Bollywood fusion dance at the Teeyan festival at the Moose Hall earlier this month. The ting of bangles, the scent of incense and the aroma of East Asian food made the Moose Hall feel like a little India one Sunday evening in August where women laughed, spoke in Punjabi and wore brilliantly decorated saris. That evening, Baljinder (Binder) Basi, gathered her young dancers, prepped their dress, their jewels and set them up on stage to perform at the North Coast’s version of Teeyan, a festival traditionally held in Punjab to bring grandmothers, mothers and children together to celebrate time away from married life. For the past 23 years, Basi has taught East Indian dance to children in the community. She doesn’t charge for her time and she encourages anyone to join. On stage at Teeyan three of the girls weren’t of East Indian descent, and more and more children are coming to her classes to learn without any prior knowledge of the culture. She was born in Punjab and grew up in a village. When she was 17-years-old, she moved to London, England where some of her family lived. They had arranged for her to marry a son of a family friend, Kevin, but only if they liked each other. “We sort of fell in love. We wanted to get married. We were kids. It happened,” Basi said. After they tied the knot, Kevin left for Canada to work for CN. Basi stayed behind with her mother-in-law to finish her studies and to learn how to cook and clean. One-and-a-half years passed before Basi joined her husband in Canada. She was 19-years-old when she moved to Prince Rupert. She loved the absence of crowds; it was too busy in England. Kevin’s family was already on the North Coast and they were familiar with at least 10 families, who Basi said have all left now. She returns to India for functions, but she’d like to visit and travel the country. For work, Basi was a clinic manager for 18 years with the Greene Medical Clinic and now she works at Dr. Michael Ryeburn’s office. Teaching dance in the community started after Basi had her daughter. “It all started with getting my daughter involved in the dance because my mom taught me. I wanted to teach my daughter. I did perform once myself a long time ago,” she said. When her daughter, Sharon, was eight-years-old she instructed an East Indian dance troupe at Pineridge Elementary School with four girls. The Indo-Canadian Sikh Association covers Basi’s basic expenses for the dancers, but she said that usually Charles Hays Secondary School and the Northern BC Museum give her free space to practice dance knowing that she offers her own services for free. In 1996, the Sikh community got involved in Seafest, and Basi was approached to coordinate a dance in the parade. In the early years, there was only Basi, her husband, their son, Justin, eight older girls and two community members. The younger girls were too shy at the time. During this year’s Seafest, the Sikh community filled the streets with dancers of all ages and ethnic backgrounds dressed in bright colours. The crowds on the sidelines had trouble keeping still, as they bounced and moved to the upbeat Indian music playing from speakers loaded in the back a truck. Her main goal is to have the girls out in the community and performing the dances they have worked on. The dances are a mix of classical and modern dances, or “Bollywood fusion.” The East Indian dancers performed at Seafest, on multicultural days, at the Port Edward 50th anniversary celebration this year and they even danced in the rain at Canada Day celebrations. “I’m doing it for our community and our culture. It gives me more happiness and pride,” Basi said, with her dimpled smile. Now, she is teaching her daughter’s children, who are three and six years old. Her one granddaughter doesn’t have stage fright. At Teeyan, she found a mic and everyone in the room wondered where the tiny voice saying “Hello, everyone” was coming from. The enthusiasm and love Basi has for sharing her culture through dance is apparent. When she travels to Vancouver she picks up bangles and tikka head pieces for her young dancers and at performances they wear them with pride and grace.